Recovered: 5 paintings stolen from the Levitan House Museum in Plyos, 3 arrests made. Russian Interior Ministry spokeswoman Irina Volk has issued a statement relaying that Russian authorities have arrested three individuals, ages 29, 33, and 37, for their suspected involvement in the August 5, 2014 3:00 am theft of five paintings by 19th century classical landscape painter Иса́ак Ильи́ч Левита́н (Isaak Levitan). The artworks were originally stolen by two individuals from the Levitan House-Museum in Plyos, a small town located on the Volga river in the Ivanovo Region where the painter lived and worked for a period of time. One of Russia's most significant and celebrated landscape artists, Levitan's naturalistic scenes, depicting and tranquil forests and countrysides, introduced a new genre of paintings which came to be known as the mood landscapes. The artist's body of work includes approximately 1,000 paintings, sketches and drawings with the bulk of his work being held in Russian museums. At the time of the artworks theft, the five stolen paintings were estimated to be worth 77 million rubles ($1.3 million). According to the Interior Ministry, the three criminals arrested in this case were said to have been involved in a series of other crimes including an armed highway robbery of cash-in-transit couriers this past November in the Nizhny Novgorod region and an earlier May 2016 bank robbery of the Nizhny Novgorod Bank where the crooks made off with more than 5 million rubles ($82,200). Officers working a joint investigation involving the Main Criminal Investigation Department of the Russian Interior Ministry, the Russian Federal Security Service, CID GU MVD of Russia in Nizhny Novgorod region, and the CID AMIA Russia's Ivanovo region executed a series of search warrants. During one, of a house in the Moscow region, Russian Interior Ministry authorities seized more than one kilogram of cocaine and recovered one of the five stolen artworks there-by detaining two suspects. 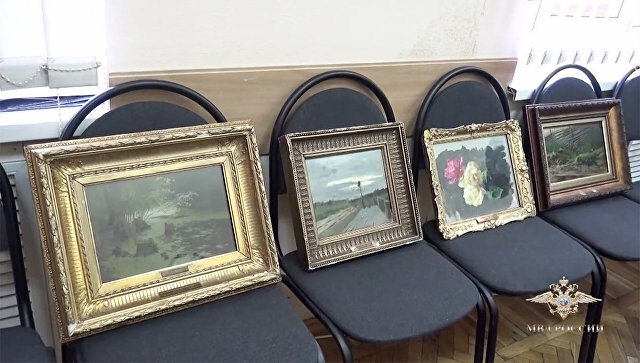 Russian Interior Ministry in Nizhny Novgorod then recovered the other four stolen paintings during a secondary search warrant of another location. In the course of an interview with Russian media, Alla Chayanov, director of the Levitan House-Museum in Plyos, reminded the public that the theft of well known, catalogued and inventoried artworks of whatever financial value, are largely unsaleable on the licit art market where famous stolen works of art are easily recognised. In cases such as this artworks only have value on the black market, usually as an alternative currency within the criminal world. A video of the recovery of four of the artworks can be seen in the news report below. As formal possessions of the Russian Federation, the recovered artworks will now be evaluated for authenticity by the matching of their accession numbers. They will then likely be sent for conservation evaluation prior to being returned to the public's viewing. Russian Federal Security Service is investigating several officials and businessmen over missing funds for state-sponsored heritage restoration projects. On March 15, 2016 Russian state media reported that the country's Deputy Culture Minister Grigory Pirumov had been detained on embezzlement charges. Earlier that day, the Federal Security Service - the main KGB successor agency known under its Russian acronym FSB - announced that several high-ranking culture ministry officials and businessmen were under investigation for allegedly “embezzling state funds allocated for restoration work on cultural heritage sites”. 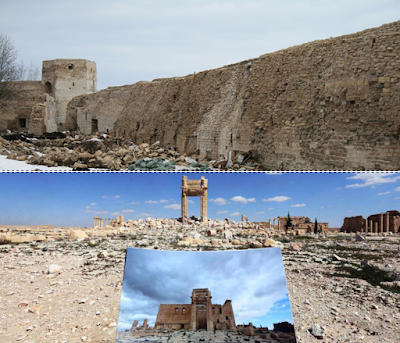 It is alleged that millions of rubles, earmarked for the restoration of famed cultural heritage sites, are missing. The detained officials, in addition to Deputy Minister Pirumov, include Boris Mazo, the head of the Russian Ministry of Culture's department of property management and investment policy, as well as several heads of construction companies involved in restoration projects commissioned by the ministry. The FSB accused Pirumov of organizing a criminal scheme in which the suspects inflated the costs of restoration works to steal public funds. Pirumov, who was appointed to the post of Deputy Minister of Culture in March 2013, coordinates and controls work of three departments of the ministry: department of property and investment policy, state protection of cultural heritage and the legal department. He also oversees activity of the State Agency for management and operation of the historical and cultural monuments of the Ministry of Culture of Russia (FGBUK AUIPIK). A source at the culture ministry said that the criminal case was linked to a number of cultural heritage sites, including the State Hermitage in St. Petersburg and the Novodevichy Convent in Moscow. 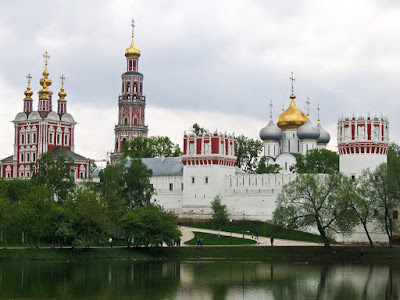 The convent, in southwestern Moscow, built in the 16th and 17th centuries in the so-called Moscow Baroque style, was part of a chain of monastic ensembles that were integrated into the defence system of the city. The convent was directly associated with the political, cultural and religious history of Russia, and closely linked to the Moscow Kremlin. Women of the Tsar’s family and the aristocracy used it, and members of the Tsar’s family and entourage were also buried in its cemetery. The convent provides an example of the highest accomplishments of Russian architecture with rich interiors and an important collection of paintings and artifacts. Restoration works there began last year, completion expected in 2019. Media reports said 800 million rubles ($11.2 million USD at current exchange rate) were allocated for this aim. 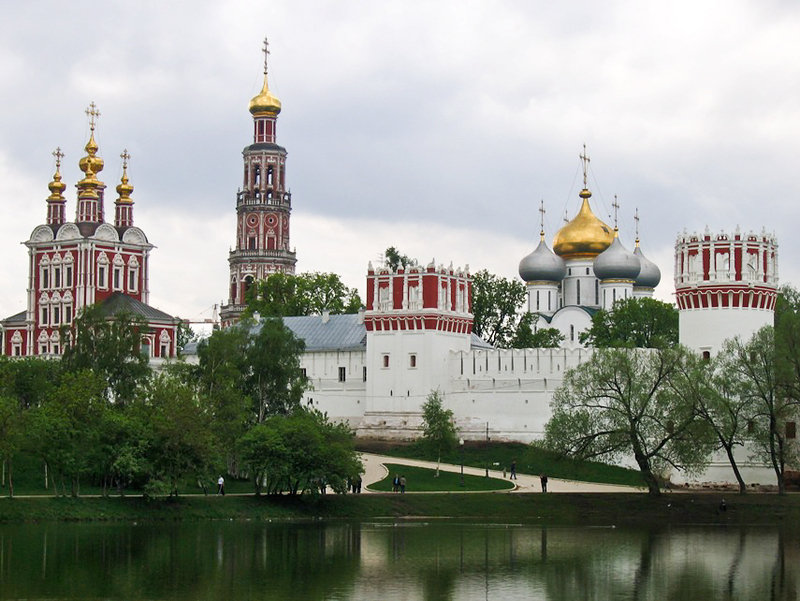 Investigators are also looking into financing of the restoration works carried out at the Ivanovsky Convent in Moscow, a theater in the ancient city of Pskov, in northwest Russia, and the Izborsk Fortress. Preservationists had raised concerns in the past over work done on the fourteenth-century fortress, located in near the Estonian border and restored in 2012 to mark the 1150th anniversary of Russian statehood. A 2013 audit by the government’s accounting chamber found that 60 million rubles, or about $2 million USD, in funding for Izborsk went unaccounted for. All this happens only two months after President Vladimir Putin publicly reprimanded the culture ministry for failing to preserve state monuments. In December 2015, at the meeting of presidential Council for Culture and Art in Kremlin, Putin chastised officials about decrepit state of the country’s rich architectural heritage. Galina Malanicheva, Chair of the central council of the All-Russian Society for the Preservation of Historical and Cultural Monuments (VOOPiK), reported at that meeting that the loss of historic sites far exceeded the average annual loss of 10 to 15 officially registered monuments, since due to a complicated listing process just over 10% of Russia’s monuments are officially registered. The Russian media blamed the subsequent reported resignation of Mikhail Bryzgalov, the culture ministry’s top cultural heritage official, on Putin’s dressing-down. Vladimir Tolstoy, Putin’s chief cultural adviser, denied that Bryzgalov’s departure had anything to do with Putin’s reprimand. Aside from the allegation of individuals siphoning off public funds, complaints have been made that the Ministry of Culture is responsible for hiring unqualified companies whose poor quality renovations have irreparably damaged Russia's cultural legacy. Russian Minister of Culture, Vladimir Medinsky, a close ally to Russian President Vladimir Putin, is in contact with the FSB on these issues. He described to the RIA Novosti news service Pirumov’s detainment as “ a real shock for all of us.” The ministry stressed that in recent years restoration initiatives led by Deputy Minister Grigory Pirumov had "achieved significant success." The Culture Ministry’s press service added that the internal audit announced by Minister Vladimir Medinsky has been underway since March 18 and is expected to take several months. Rumors about Medinsky’s possible resignation have been swirling since the March 16th arrest of Pirumov. On March 28, 2016 Kremlin spokesman Dmitry Peskov refuted these allegations. Medinsky chairs Russia’s Military History Society, which has a powerful influence over the interpretation of Russia’s cultural affairs. He has also reportedly told UNESCO that Russia is ready to participate in both evaluation of Palmyra's condition and its restoration. In early April, Deputy Minister of Culture - theologian Alexander Zhuravsky was appointed to replace Mr. Pirumov. On April 20th the Moscow Times reported that Russian law enforcement officials have frozen bank accounts and property owned by Deputy Culture Minister Grigory Pirumov. On April 23rd, TASS and RIA "Novosti" reported that the Lefortovo court of Moscow had also arrested the head of the Directorate for Construction, Reconstruction and Restoration of the Ministry of Culture of the Russian Federation, Boris Tsagaraev, in connection with the multi-million dollar embezzlement of public funds allocated for the restoration projects. Tsagaraev is currently in custody on a FSB warrant. Like all the others arrested in this case, he is accused of conspiring to obtain state contracts based on fraudulent information as well as inflating the costs of restoration services in order to steal money. The FSB said it hasn't been able yet to track down the missing funds.